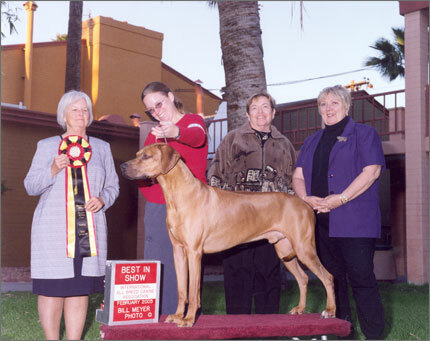 Whelped September 11, 2000, Chevy finished his AKC Championship from the Bred-By Class in September 2001. He is multi-Group One and Group placing and with limited showing ranked in the Top 25 for the 2003 AKC/Eukanuba Invitational. 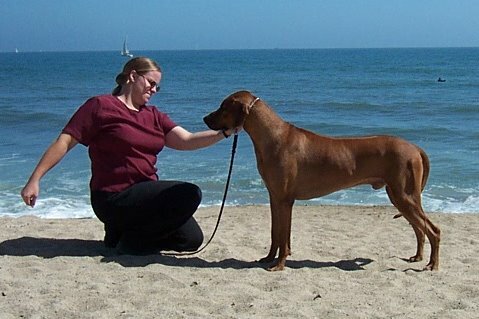 He has been exhibited at the Westminster Kennel Club show. 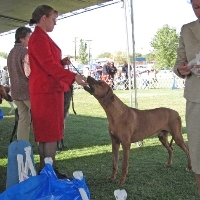 He is shown in the picture above taking a Group Three at the White Mountain Kennel Club show in 2001. Shown taking Best in Show at the IACCB International Show in Tucson, Arizona; Ryan Scalf Buzard, handler. Judge Roger Hartinger awarded Chevy Best of Breed at the Tucson Kennel Club show. Chevy holds multiple Best of Breed placements. Chevy took Best of Breed from Veterans Class at the Valencia Valley Kennel Club show on October 12, 2008. He was handled by Ryan; these pictures were taken during Group competition.